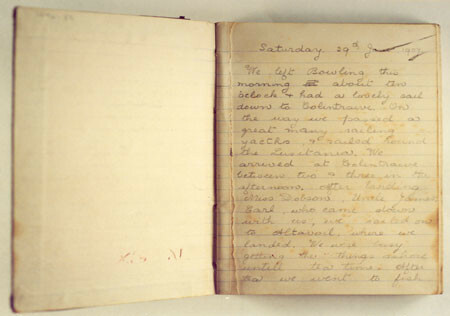 This paper covered notebook contains a section of diary written by school girl Jenny Scott at the age of nine. It covers a holiday between the 29th June and the 31st July in 1907, when the Scott family took a house at Colintraive on the Firth of Clyde. Many of Jenny's holiday activities centre on the family's steam yacht Carola, which was built by the Scott's shipbuilding yard in 1898. During the summer months the boat was used for leisure, cruising around the Clyde, but in winter the boat took on a more practical role as a tugboat within the Scott's yard. The diary describes trips to Gourock for coal, trips to Rothesay to collect family members from the steamer, and evenings spent playing bowls on board when the midges on shore became too much to bear.